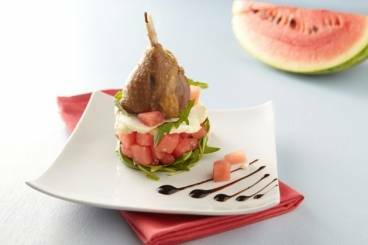 A fresh salad of rocket, watermelon and goat's cheese topped with crisp confit duck leg. Cut the watermelon in half, remove the skin and dice the flesh into cubes, removing the seeds as you go. Remove the skin from the goat's cheese and keep at room temperature to allow it to soften. For the duck: cut the duck leg in half through the joint between the thigh and the drumstick. Place the duck pieces skin side down in an ovenproof dish, transfer to the oven and cook for 20 minutes until the skin is crisp and golden brown. Rinse the rocket leaves, pat dry and discard any that have begun to wilt. Season the rocket with salt, pepper, a drizzle of olive oil and a squeeze of lemon juice. Add the watermelon pieces to the rocket and crumble the goat's cheese over the salad. Serve each piece of confit duck on a bed of salad and finish with a drizzle of reduced balsamic vinegar.